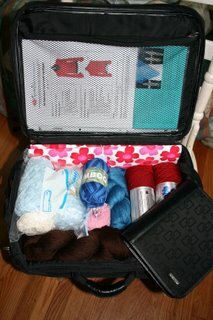 So my big quandary about packing for (Kn)Italy is how I’m going to manage all my knitting supplies. In July, when I traveled to Georgia to see family, I packed a whole suitcase just for knitting. It makes me happy just looking at it. But clearly, that would be stupid for a trip to Italy. Especially because I am trying really, really hard not to check any luggage. 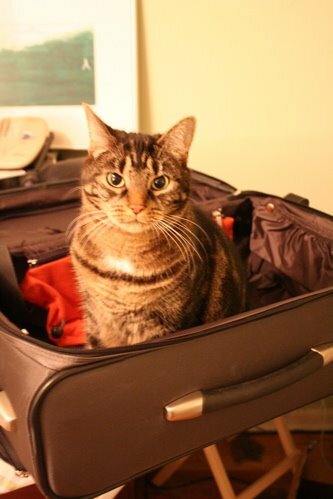 Which means one carry-on sized suitcase and a big tote bag. (And only whatever hair products I can fit into tiny containers and stuff into a quart-sized bag). To be honest, I am not the low-maintenance sort. So this will be quite the challenge. But I’m pretty determined. Since I’m traveling by myself for the first part of the trip and will be carting my luggage on and off trains, in and out of taxis, and up and down streets, I want to make things as easy on myself as possible. I also don’t want to have to deal with waiting to claim checked luggage. (The last time I flew internationally, my checked luggage did not arrive for two days, and then some stuff had been stolen out of it.) 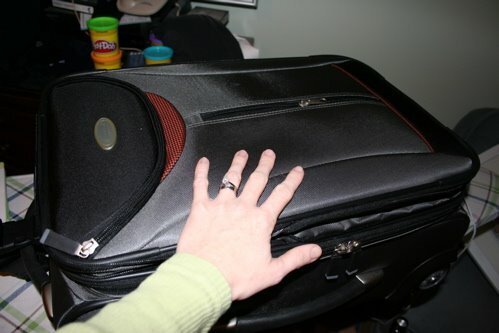 Plus, I plan to bring a small duffel bag inside my suitcase to put gifts in along the way; I’ll check that bag on the way home. All-in-all, it sounds like a pretty good plan, eh? Play-Doh shown for lack of cleaning. So what do you think? Am I nuts? I have worked really hard to minimalize my wardrobe. Here’s my big coup. The perfect pair of shoes. That’s right, I am going to attempt a feat I have never, ever tried before. One pair of shoes, for a whole trip, to go with everything. These are Earth Shoes and they are super-comfortable. I’ve tried them on with the three pairs of pants and the one skirt I’m packing, and they work with all of it. In the past, shoe-packing has probably been my biggest packing issue. Now the two big issues will be my knitting and my books. Prioritizing is very difficult for me. Bookwise, I will for sure bring one novel, a travel journal, and my Italian-English dictionary. Beyond that, I also want to bring my Idiot’s Guide to Italian and at least one of my travel guide books. I realize this may be too much. Knitwise, I think I’m screwed. As you can see from the first picture, I tend to pack everything I might possibly be able to use, including every possible needle and pattern. How much knitting can I get done in 16 days, including two long plane trips and some train travel? 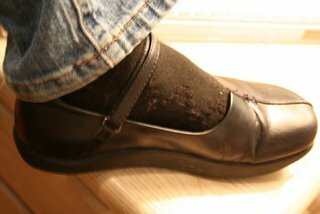 I will definitely pack two balls of Lorna’s Laces for my toe-up socks, plus the necessary dpns. Maybe that should be all I take. But it would kill me to only have one project option, especially if I were to finish it. I thought I might take one pair of circs and maybe two or three skeins of Malabrigo to make some more scrunchable scarves. The TSA website recommends bamboo or plastic needles, but my circs are metal. Have any of you had any trouble flying with metal needles? I would appreciate any tips about how to prioritize knit needs for travel, as well as any anecdotes about traveling with knitting. Oh, but here is one beautiful thing about what promises to be a very beautiful trip. There is an awesome LYS about a block-and-a-half from where I’m staying in Florence! Che bella! Wow! One pair of shoes — I’m so impressed. Shoes are always my downfall when packing. Maybe that’s because I’ve yet to find the perfect pair — yours are very cute!!! Thanks, Becky, but I actually do own bamboo needles in most of the sizes I would need. I just prefer my metal circs for everything except things that call for dpns. You know me, I’m a picky, picky girl. And if someone (like TSA) tells me I can’t do something, it just makes me want to more!! I love your shoes…..but am feeling your pain in deciding what to pack knitwise. For myself it would be easy….since I am new to the world of knitting I am slow so a pair of socks would work for me since it takes me a while to finish (a few weeks)….but then again alone for part of the trip, no kids….16 days…..cute cafes to order a tea and sit and knit…..oh man!!! Either way I am sure you’ll have a blast!!! longtime reader, first time commenter: just wanted to say i love your blog (and the lacey cardigan is just gorgeous). and – i have those shoes!! i love ’em. you will be very stylin and comfy in italy – have a great time! ITALY!!! I am so excited for you! I would love to go to Italy….Those shoes are nice! I am so impressed that you have limited your shoes to a single pair. I usually need a bag just for my shoes! I’d probably bring a pair of socks to work on and the necessary dpn’s or circs to work on them….Besides if you finish what you brought that is a great excuse for some Yarn Shoping in Italy! I almost got those shoes:) Instead I got the Earth Envy slip ons with the crisscross thingies in front. I love earth shoes.